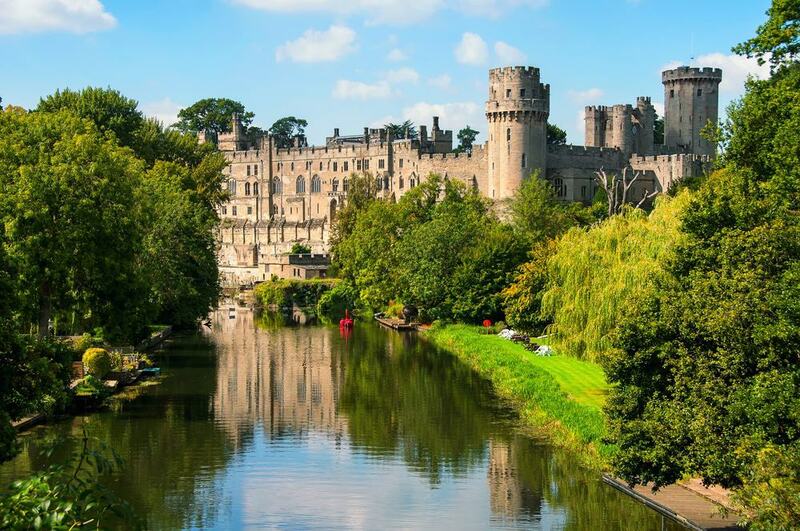 England is home to some of the world’s best and most beautiful castles. Considering that England has had a long royal history that is still ongoing these days, it comes as no surprise that you would find beautiful castles and noble manors across the country. 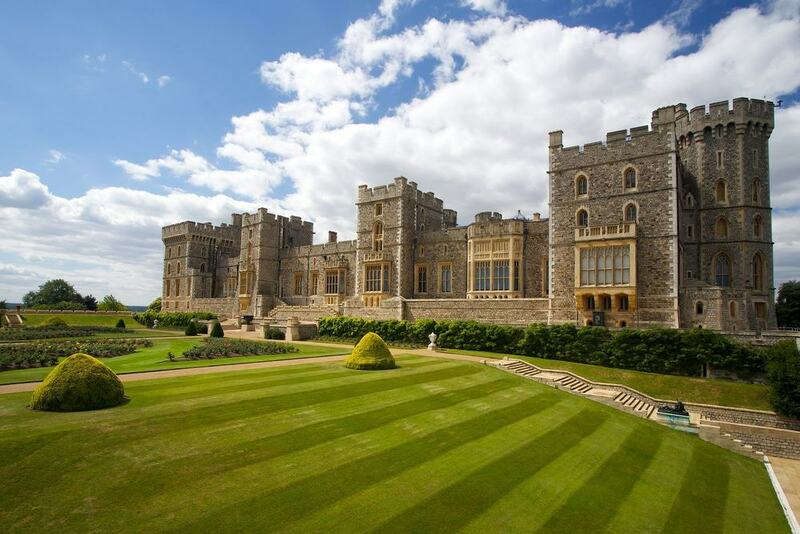 Let’s jump straight in and start this list with Windsor Castle that proudly bears the title as the oldest castle in the world that is still inhabited by the royal family. On top of that, it’s also the largest, occupying approximately 5 hectares or 13 acres. This Berkshire-based royal residence was built in the 11th century and took around 16 years to complete. Originally the castle was supposed to guard London against being approached from the Western side. Quickly, however, it became a royal residence due to its location and the fact that it was close to the royal hunting grounds. The design of the castle is made up of two four-sided building complexes which are divided by the Round Tower that can be seen from far away. Nowadays, the Queen uses the castle as both her weekend home as well as a royal residence for official duties. Normally you wouldn’t expect to find a castle amidst a buzzing metropolis. However, if there is one place where it can happen, it’s England and its capital London. The Tower of London attracts nearly 3 million tourists each year, and even though it is notorious for being used as a prison, it is one of the most well-known castles and fortresses in England. 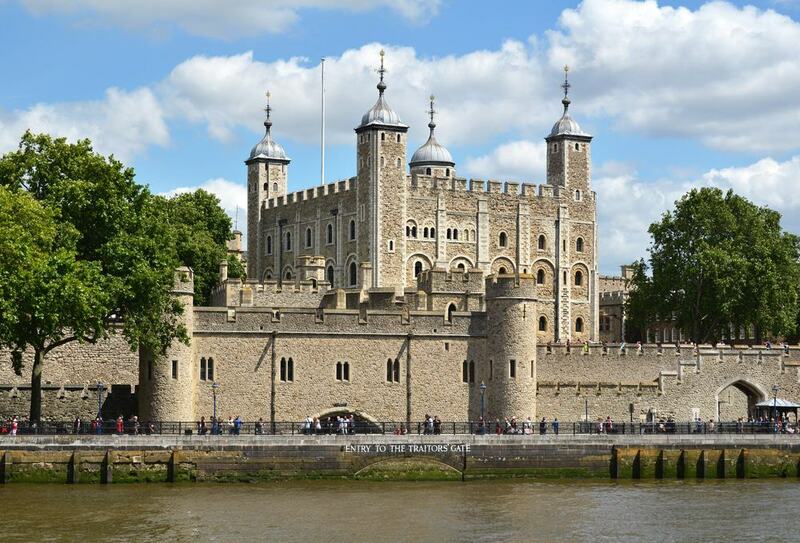 At the center of the complex is the White Tower, built by William the Conqueror in the 11th century, and nowadays is the main attraction for tourists visiting the Tower of London. 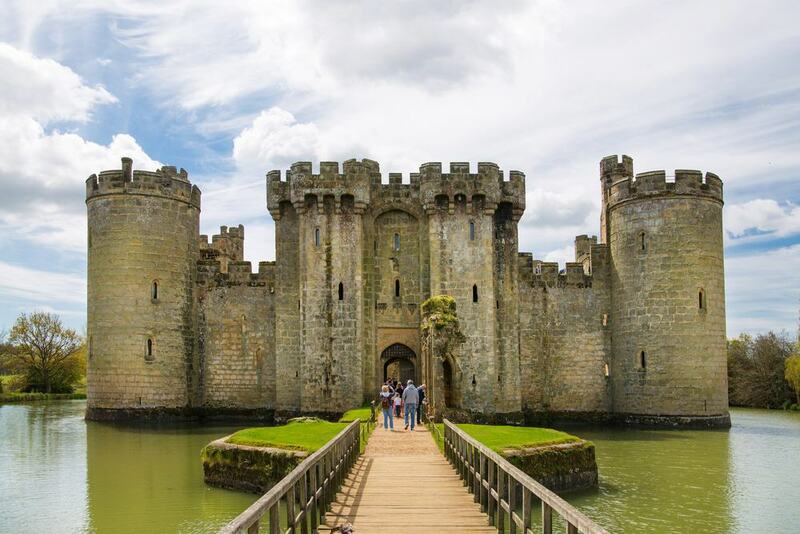 Bodiam Castle is one of the best examples of Medieval castles in England and to this day retains its picturesque appeal featuring a moat and circular towers as well as a gatehouse entrance with twin towers. Despite its near-perfect exterior, the interior hasn’t survived the test of time, however, enough of it remains to represent the inner layout of the castle. The East Sussex-based castle was built in 1385 by Sir Edward Dalyngrigge, who deliberately built it to serve a defensive purpose. 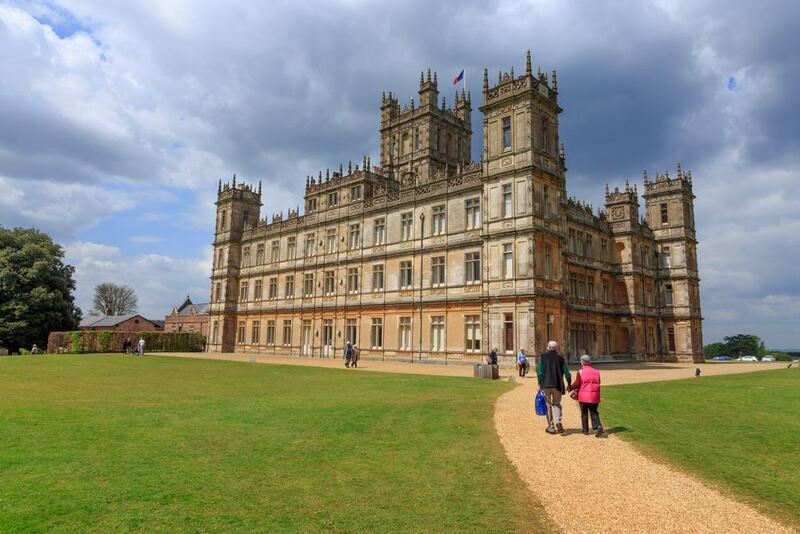 To anyone who has ever watched Downton Abbey, Highclere Castle will immediately seem familiar. The Victorian castle in Hampshire, built in the second half of the 17th century, is among the most beautiful castles in England. Surrounded by 1000 acres of parkland, Highclere Castle was the home of Carnarvon family that lived there ever since the castle was built. However, previously the site was owned by Bishops of Winchester and an earlier home stood in the place of where Highclere Castle is now. The castle features beautiful staterooms including a saloon with leather wall coverings, a state dining room, a library, music, drawing, and smoking rooms, all of which feature artwork and intricate interior details. 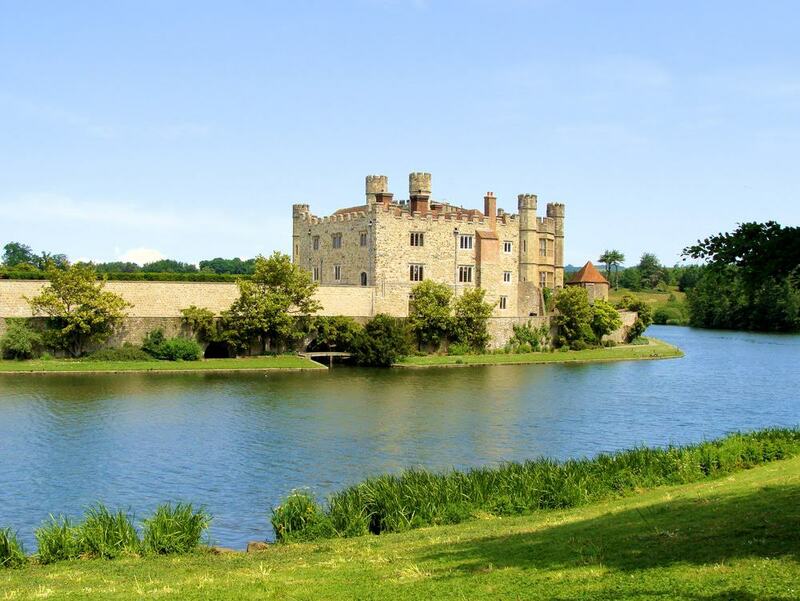 Despite what the name suggests, Leeds Castle isn’t actually located in Leeds but in Kent. A castle in the same location dates back to the 11th century, and two centuries later it became one of the preferred residences of King Edward I. In the 16th century, Catherine of Aragon, the first wife of Henry VIII also resided in Leeds Castle. What is known as Leeds Castle today dates back to the early 20th century. The earlier castle had succumbed to a ruined state by the late 18th century, and in 1823 the new castle was finished in Tudor style. In 1926 Leeds Castle was bought by Anglo-American heiress Olive, Lady Baillie, who finished restoring the castle. 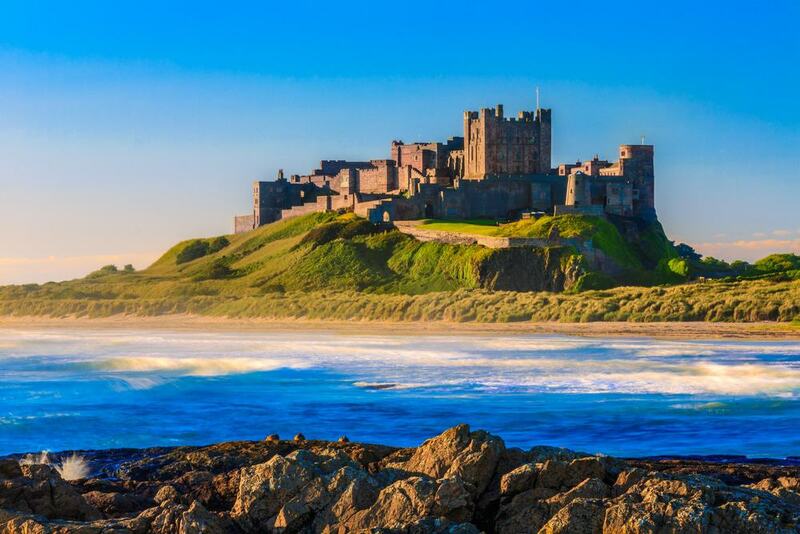 Few people would be left indifferent upon seeing Bamburgh Castle, which graciously sits perched on a volcanic dolerite hill on the northeast coast of England in Northumberland. Built on the site of a previous Celtic fort, Bamburgh Castle occupies nine acres on a rocky plateau. Due to its unique look, Bamburgh Castle has been featured in various films and series over the decades. Another well-known castle loved by both locals and foreigners alike is the Warwick Castle in Warwickshire. Originally a motte-and-bailey castle established after the Norman conquest of England, in the 12th century it was rebuilt in stone. Located on the bend of River Avon, Warwick Castle features a dry moat along the northern side since there is no protection by the river. In the 14th century additions for defense were made by adding a gatehouse, Caesar’s Tower and Guy’s Tower, as well as a barbican. The West Sussex castle of Arundel dates back to the 11th century even though just like many other English castles, large parts were entirely rebuilt later on, during the 18th and 19th centuries. 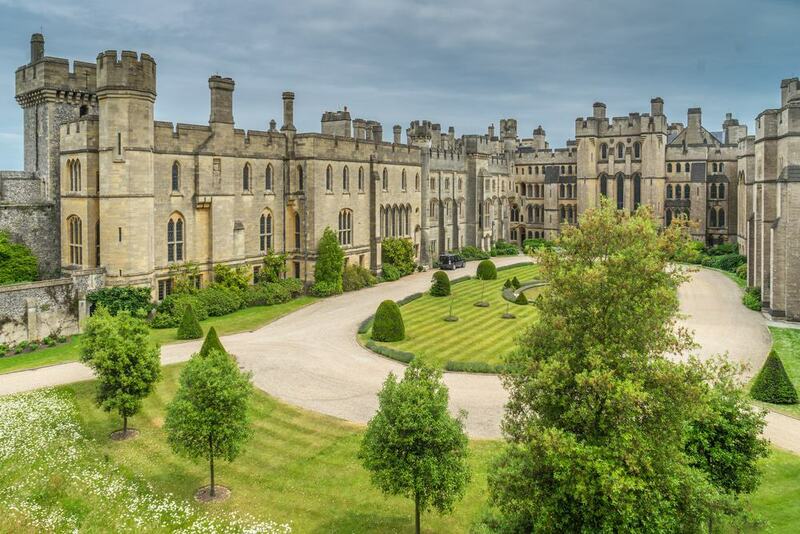 Arundel Castle is among one of the castles that were built by William the Conqueror. During the English Civil War, the castle underwent serious damage but a new folly overlooking Swanbourne Lake was built in the 18th century. Arundel Castle was one of the first English castles that enjoyed the luxury of central heating, electricity, and lifts. Set amidst beautiful estates and parkland, Framlingham Castle is a late 12-century castle that was built by Roger Bigod, Earl of Norfolk. For over 400 years it housed dukes of Norfolk. 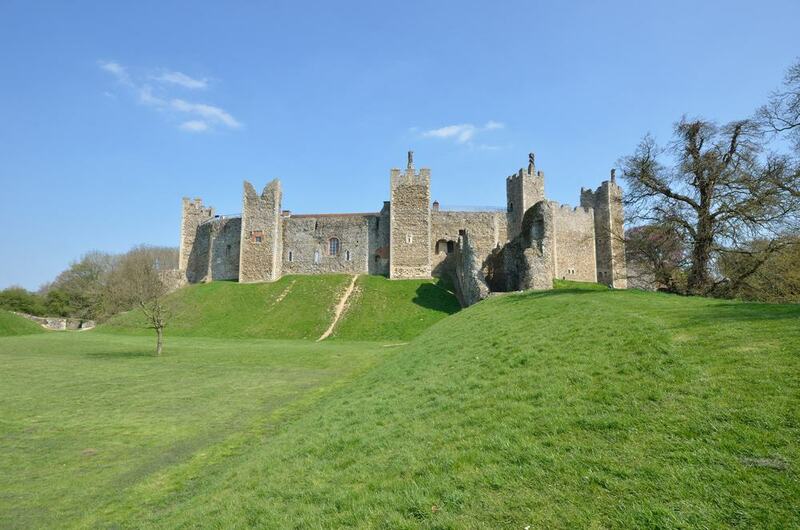 Framlingham Castle is a typical example of Medieval castle design. It overlooks River Ore and is made up of three parts. Surrounded by a mere and farmland, the castle consists of the Inner Court, the Lower Cour, and the Bailey. Around the Inner Court, you can find carved chimneys, only three of them functional, the rest are ornamental, and these date back to the Tudor period. Framlingham Castle is thought to be rather advanced for its time regarding military defense. 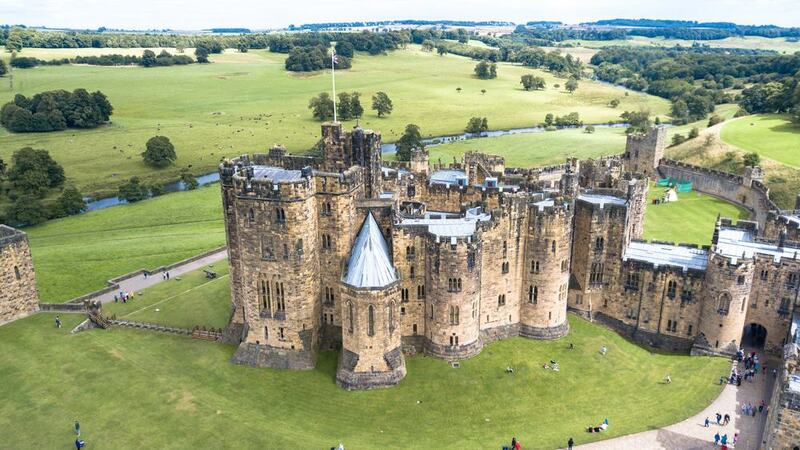 In the English county of Northumberland, built after the Norman Conquest, Alnwick Castle is one of the first castles in England that was built without a square keep. The castle is separated from the town by a deep ravine on one side and has the River Aln passing on the other. The castle consists of two parts – the inner ring contains principal rooms, and another part was constructed later to provide more accommodation. Both parts are connected by a link building. Along the outer bailey, the castle features towers at regular intervals. Its uniquely picturesque appeal has made it a favored filming location for several films and series. Famously, it was featured in the first two Harry Potter films. Everyone who has seen the films will recognize the Outer Bailey as the location, where Harry and his fellow students learned to fly. The inner courtyards were also used to represent the Hogwarts school. Bolsover Castle is located at the very heart of England, in Derbyshire. The early 17th-century castle was built by Cavendish family on the site of a previous medieval castle. The castle is renowned for its slightly mysterious character, and in 2017 it was voted the spookiest English Heritage site. 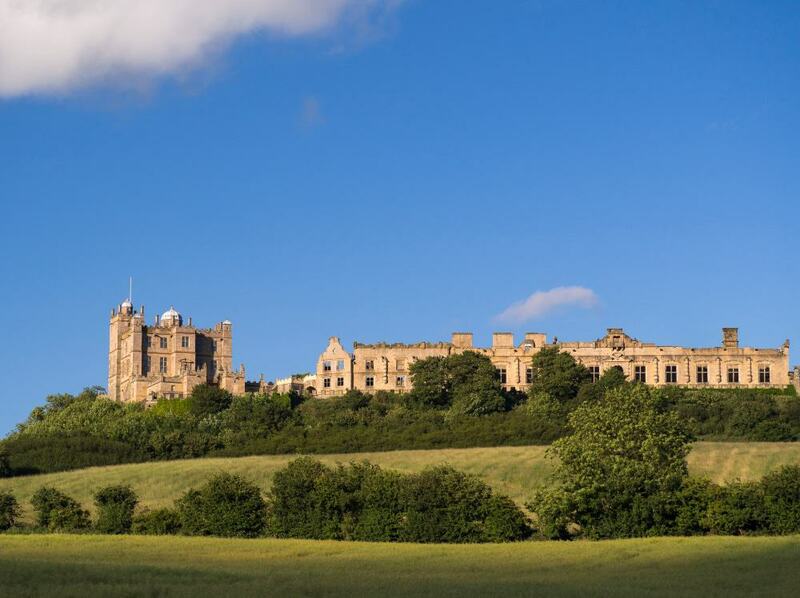 Sitting on a ridge above the Vale of Scarsdale, Bolsover Castle was designed to be a comfortable residence rather than a defensive castle despite its visual appearance. The main building that attracts attention from the whole complex is called the Little Castle. That’s the impressive square-shaped building overlooking the whole site, and it features beautiful wall paintings and interiors. 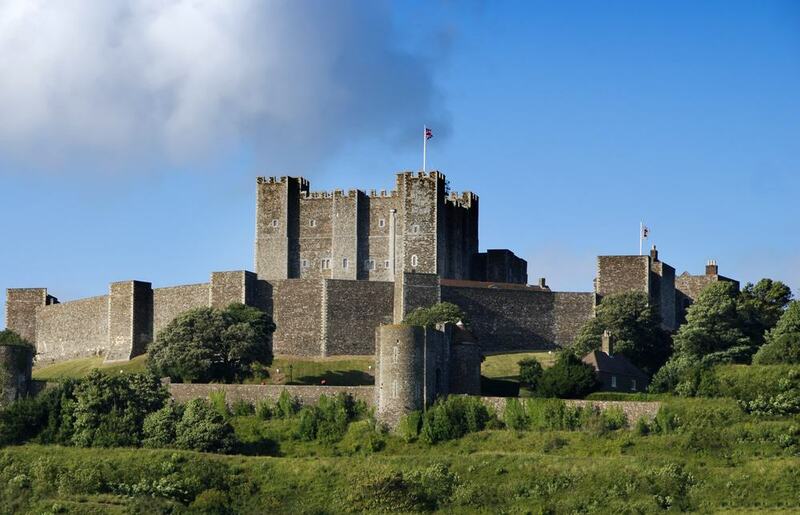 Dover Castle sits perched on a hill overlooking the blue waters of the English Channel. It has had significant importance historically thanks to its strategic location. The current castle was built by Henry II, and the works started in 1180. Over the next centuries, the site and the buildings on it were changed. The adjustments were needed to meet the requirements of warfare. The walls reach a thickness of up to 21 feet and serve a defensive purpose. In its lifetime, the castle has gone through two sieges. It also served an important purpose during both World Wars, again, due to its strategic location, overlooking the crossing to mainland Europe. 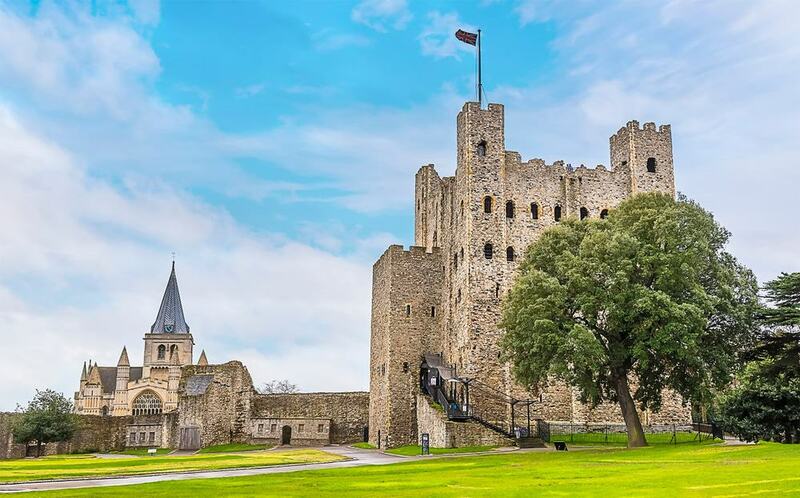 One of the best-preserved castle stone towers in England and even France belongs to Rochester Castle in Kent. The 12th-century Norman architecture keep is the main feature of the whole castle. Unfortunately, to this day, only the walls of the keep survive while floors and roof are no longer intact. The castle’s construction began at the end of the 11th century by Bishop of Rochester, and the square towers were added approximately 40 years later. The castle was one of the main strongholds in the rebellion against King John. 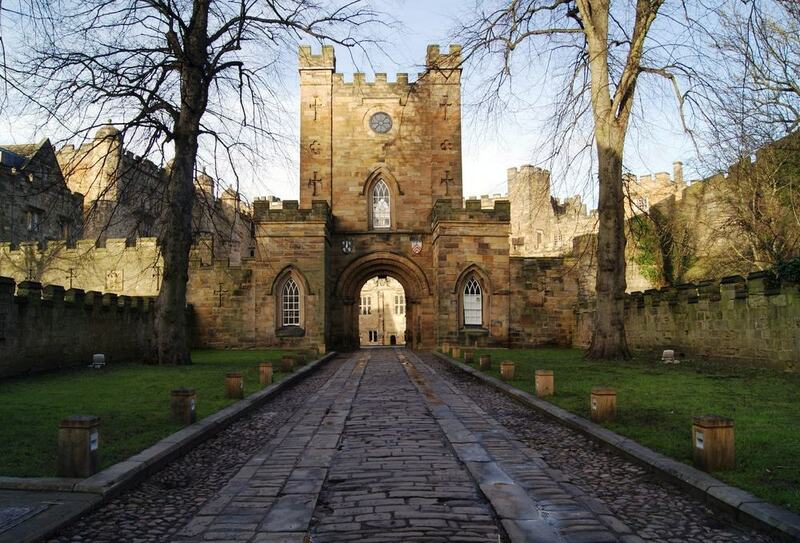 One of the English castles occupied by a university nowadays is the Durham Castle in the north of the country. Sitting on top of a hill above River Wear, the castle is an example of motte and bailey castles signature to Norman architecture. Up to the 15th century, the Great Hall within the castle was the largest great hall in any castle in Britain. Durham Castle had a strategic purpose controlling the Scottish border as well as English rebellions. 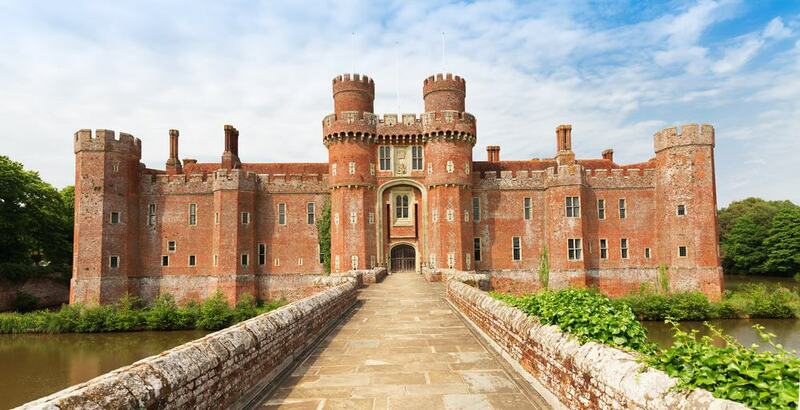 Herstmonceux Castle features a unique red brick design that beautifully sits in the surrounding landscape with a moat and a thick cover of trees. Built in the 15th century, the castle was originally a manor house which got rebuilt in a grandiose way using red brick – a rather rare and luxurious material for the time. The castle grounds and gardens consist of over 600 acres of woodlands. Nowadays the castle is occupied by Queen’s University, Canada and its international study centre.